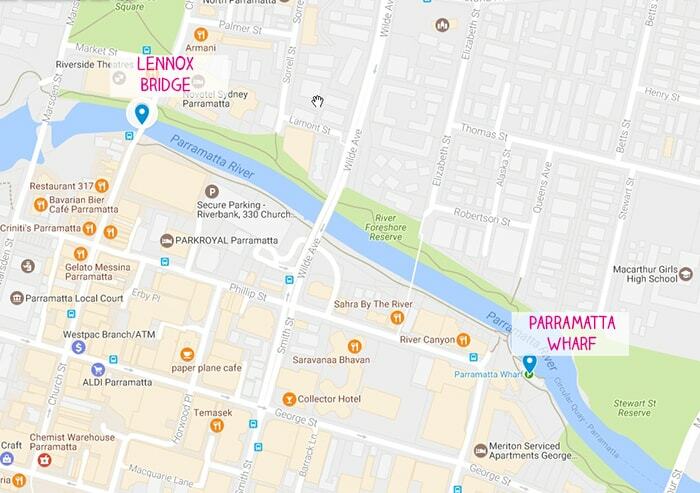 This is a short but very engaging walk alongside the Parramatta River, using the pathways that run along both sides of the river between Lennox Bridge and the weir by the wharf. 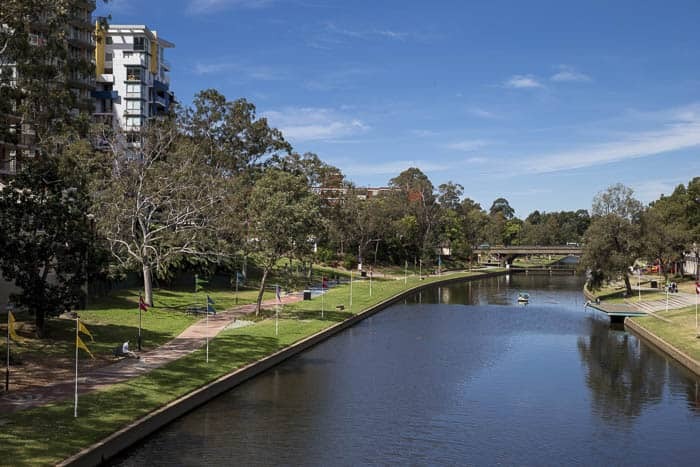 The river runs through the busy heart of Parramatta but is a tranquil and quiet haven. If you come by car, train or bus, start at Lennox Bridge. There is a flight of steps down to the riverside. The ferry journey to Parramatta from Circular Quay by Rivercat is a beaut trip and you can read all about it here. Those who arrive at the Parramatta Wharf by ferry can do the walk in two sections (see below). Along the northern side, marvellous artwork by Aboriginal artist Jamie Eastwood covers the walkway. 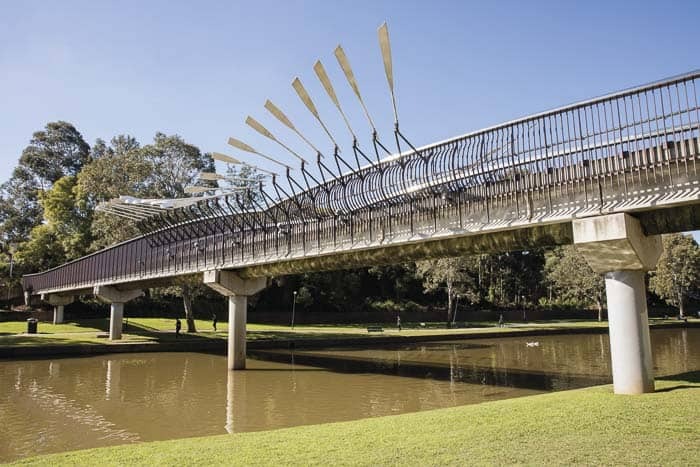 The artwork tells the history of the Parramatta River and its people from an Aboriginal perspective and it is a very bold, bright and enlivening sight. So this walk provides a gentle leg stretching with a cultural experience, all by the peaceful river. There are some good shady spots on the grassy slopes by the path that can be used for picnics or rests. The river is not fenced and so again this is not a walk for young toddlers or unruly young children. There is no shade along the river so in warm weather BYO umbrella. Start at the top of the steps on the south side of Lennox Bridge. There are 35 steps here. Having negotiated them, the riverside path is very pleasant, flat and smooth as it passes lilies and ducks on the water. The path also passes the Riverbank Centre, with its shops and offices and then the David Frater carpark. Then it goes under the David Wilde Bridge, where there is a low wildlife bridge running over the water although no wildlife can be expected to cross during daylight hours, most disappointing for children. Further along the path is a pedestrian walkway over the river, joining Elizabeth Street on the north to the south side of the river. The Elizabeth Street Footbridge designed by Sydney artists Greg Stonehouse and Susan Milne over the beautiful Parramatta River, Parramatta. A huge pipe also crosses the river at this point and any plans from accompanying children to try balancing their way across it must be immediately quashed. Further along, apartment blocks line the river. There are some trees here which throw shade on the grass and it is a nice place to stop for a picnic or a play. Just ahead is the weir which divides the tidal part of the Parramatta River from the freshwater part. Beyond the weir is the wharf. Cross the river over the walkway above the weir. On the north side of the river the pathway is very wide and it’s possible to have two or three strollers rolling along side-by-side, great for mums having a chat as they walk. This pathway weaves in gentle curves. With its artwork, picnic tables and bubblers, the walkway is more than a functional path, it is a cultural experience in itself. 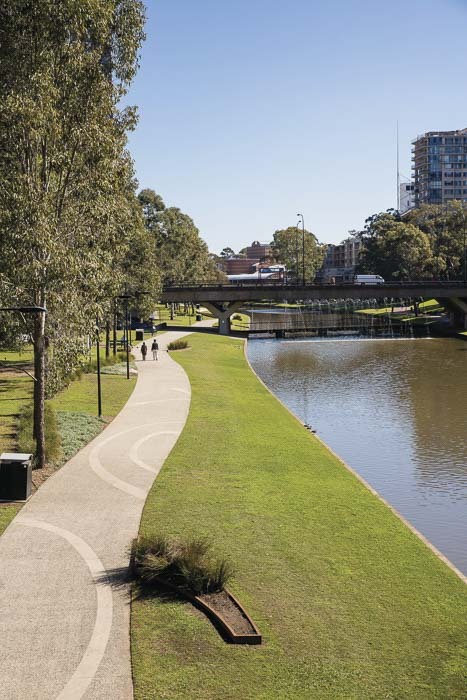 The artwork decorating the width of the path tells the story of Parramatta’s original inhabitants, the Burramatagal people. The paintings include outstretched hands, rainbow serpents, huge fish, eels, Baludam the young warrior, turtles and other bush tucker, the coming of the Europeans, speared soldiers and other representations of the conflicts between the settlers and the Burramatagal. Information boards alongside the path way explain the significance of the artwork. Here you will also find the excellent Parramatta River Foreshore Playground. Any children who can climb or slide will love this. 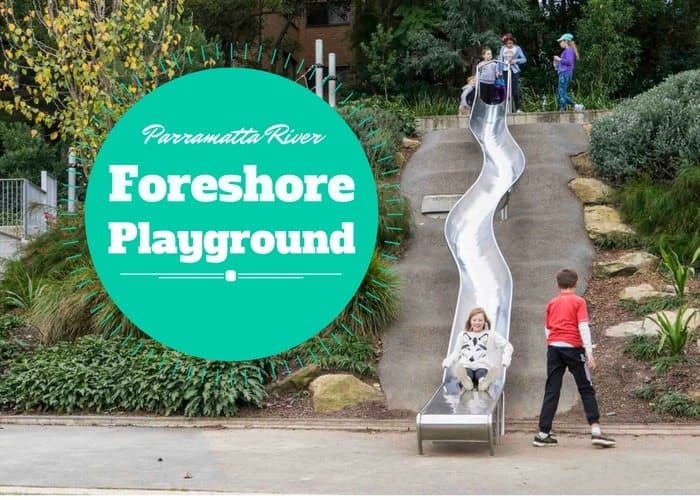 Read all about Parramatta River Foreshore Playground here. This delightful stretch of walkway ends all too soon at the 30 steps leading up to the north side of Lennox Bridge. These pass the Parramatta Heritage Centre, which is immediately to the left. Across the road is the Riverside Theatre. Of course you can walk further into Parramatta Park from Lennox Bridge if you’d like to extend the walk. Simply follow the path from the wharf to the weir, walk over it and then along the north side of the river to the Lennox Bridge steps and then back to the weir. The south side of the river can also be walked along to its steps at Lennox Bridge and then back to the wharf. Riverwork artwork by Jamie Eastwood located on The Parramatta Walk with beautiful views of the Parramatta River, Parramatta. Thanks to Destination NSW for providing three lovely photos of this walk. Much better than the ones I took! Where do you love to walk with your stroller and kids?